Welcome to another exciting week as we team up with another company. This week we are partnering with Fancy Pants Designs and both teams have been busy creating some amazing projects you are going to love. Time for Day 4 of this week-long blog hop. Get ready to be inspired by some amazing projects designed with Fancy Pants Designs beautiful patterned paper and accessories as well as Add a Little Dazzle Craft Metal Sheets. Let the fun begin! Couldn’t help myself…had to make another one of the ornaments 🙂 This time, I used a white gift bag, and added some of the Fancy Pants Me-ology paper to dress it up. I’ve used the Baby Blue craft metal to make the background and the bow. The sweet little deer is made with Brushed Bronze craft metal. I’ve added some snow to the trees and then dropped more into the ornament before sealing it up, thus making a snow globe. Cool hmmm? Looking through my stash, I happened to find some ribbon that matched the Baby Blue craft metal perfectly, so tied a little bow on the handles of the bag. You may indeed see more of these ornaments before Christmas, as I am hooked on making them! Did You Know There Are 10 Fridays Until Christmas? 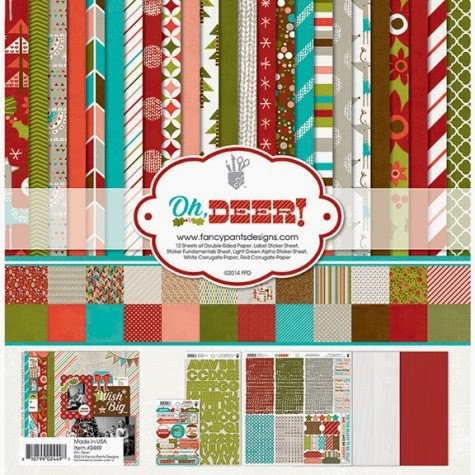 We are here to help you and have added the Oh Deer Patterned Collection Kit from Fancy Pants Designs and more fun items in the boutique. The Oh Deer Collection Kit includes: 12 sheets of Double-Sided Paper, Label Sticker Sheet, Sticker Fundamentals Sheets, Light Green Alpha Sticker Sheets, White Corrugate Paper, Red Corrugate Paper. In addition, each pack will include 12 Add a Little Dazzle Craft Metal Sheets that coordinate with the pack. You will receive two metal sheets in each of the following colors: Baby Blue, Scarlet Red, Brushed Bronze, Dark Chocolate, Golden Glimmer, and Wondrous White. This is an EXCLUSIVE PACKAGE for the Add a Little Dazzle Boutique. Get started on your holiday projects now. Order your pack in our Boutique TODAY and make sure to take advantage of our FREE SHIPPING! We have an awesome giveaway! Enter for a chance to win 1 of 2 prize packs from both companies! You have until Sunday, October 19th midnight to enter. The winners will be announced on both company blogs. 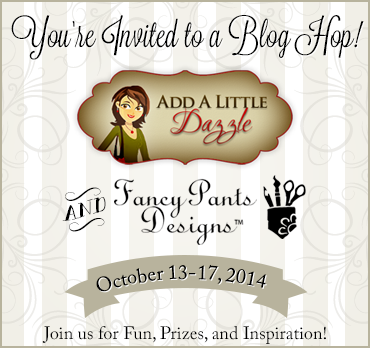 YOU MUST LEAVE A COMMENT ON BOTH THE ADD A LITTLE DAZZLE AND FANCY PANTS DESIGN BLOGS TO ENTER FOR A CHANCE TO WIN. Lee-Anne I just love your beautiful bag (I have a stash of white bags) but what I'd like to know where you get those ornaments from I also love the previous one with the purple Dazzle metal sheet as well. Had to pop over and tell you I think the snow globe ornaments are brilliant! Yes! Make more! Your ornament is incredible!! I really need to give it a try!! 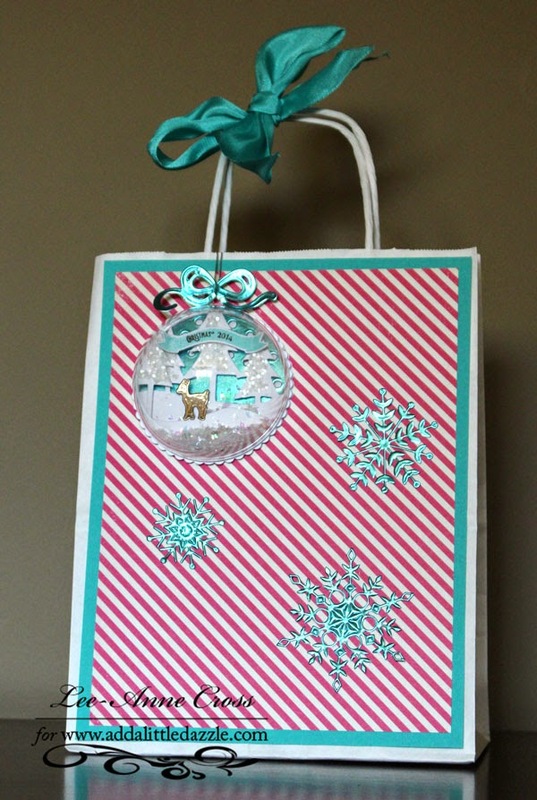 Your gift bag is sure to be a hit with the recipient! I know that if I received a gift in this bag I would keep the bag forever!!! The ornament is definitely cool, but can you explain how you made it? I, of course, want to try making that too! Tfs. How cute and festive with the red stripes and the blue metal. LOVELY snowglobe and flakes on your sweet and festive bag!! This is my favorite project for today! I love the colors and the ornament! Would you please share a tutorial on how to make the bowed ornament? TFS!!! These snowflakes do dazzle. Oh my goodness, so beautiful! Wow that snow globe and snowflakes look so amazing!! This is a great gift bag! I love the ornament you made and the papers really make it pop. wow, that is a beautiful creation, So pretty and unique. Fun!